A 10-year-old girl with a left ventricle noncompaction and strong family history of sudden cardiac death had received transvenous implantable cardioverter defibrillator (ICD; Evera VR, Medtronic Inc, Minneapolis, MN, USA). Device was implanted in the left subpectoral area using a left axillary vein access. Venous puncture was performed using the first rib technique under fluoroscopy guidance with no difficulties. A single coil DF-4 ICD lead (Medtronic, Sprint Quatro 6935M -62 cm) was inserted and positioned at the right ventricular apex with excellent sensing and pacing parameters. 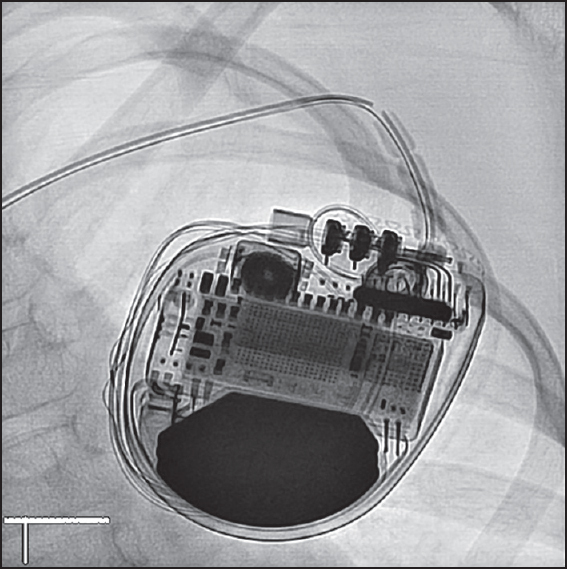 She presented 1year later with device alarm and was found to have a high ICD lead pacing impedance (>3,000 Ω), undetectable R-wave, and non-capture. The Lead Integrity Alert prevented inappropriate shocks. She was not involved in any form of competitive sport or direct trauma. Fluoroscopy showed lead fracture [Figure 1]. The patient underwent ICD lead extraction using a simple traction with the aid of a Lead Locking Device (Spectranetics, Colorado Springs, CO, USA). Although the polyurethane surrounding the lead was intact, a conductor fracture could be observed through the insulation about 1 cm beyond the tie down. A new ICD lead then was implanted. The evolution of new leads technology simplified the implantation techniques and improved the pocket profile particularly in pediatrics; however, this technology is yet to be evaluated. The first report of aDF-4 ICD lead fracture highlighted the possible mechanism of fracture. A multicenter post-approval study for St. Jude Medical TM DF-4 system showed a 0.1% fracture rate;  however, the mechanism of the lead fracture was not described in this study. In our report, we described aDF-4 ICD lead fracture in a pediatric patient. Although the lead was angulated at the entry point into the vein, we think this is not enough to explain the lead fracture. Given the increasing number of DF-4 ICD lead implantation in the recent years, such lead fracture may gain more attention. Cassagneau R, Hanninen M, Ganiere V, Defaye P. Failure of a spliced DF-4 ICD lead. Heart Rhythm 2013;10:1829. Cantillon DJ, Ha K, Styperek R, Jumrussirikul P, Mirro M, Wong W, et al. Clinical experience and procedural outcomes associated with the DF4 implantable cardioverter defibrillator system: The SJ4 post-approval study. Pacing Clin Electrophysiol 2013;36:855-62.